Wednesday, Oct. 17, 2018, is International Pronouns Day, which seeks to make asking, sharing and respecting personal pronouns commonplace. According to the International Pronouns Day official website, referring to people by the pronouns they determine for themselves is basic to human dignity. Being referred to by the wrong pronouns particularly affects transgender and gender nonconforming people. Together, we can transform society to celebrate people’s multiple, intersecting identities. More than two dozen faculty, students and staff sit on the University’s Preferred Name, Pronouns and Gender Advisory Council (PNPGAC). This group is charged to improve preferred name, pronoun and gender inclusivity among databases and systems across campus. They aim to advance general awareness of the University’s Preferred Name Policy by expanding services and understanding of how and where preferred name and pronouns make a difference in student experiences. 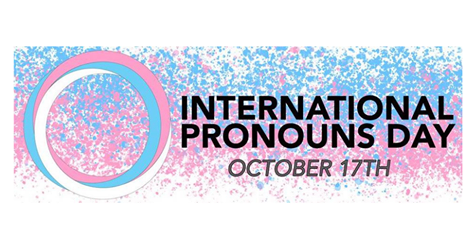 Members of PNPGAC will be hosting a table in the Milton Atrium of the Life Sciences Complex from 10 a.m. to 2 p.m. on International Pronoun Day, Wednesday, Oct. 17. You’re invited to stop by and find out about the Preferred Name function in MySlice and indicate your interest in being a potential focus group member to discuss adding the ability to designate one’s preferred pronoun to MySlice. Council members will have a sign-up list for the focus group sessions, as well as iPads and a GIANT mobile touch screen with which they will show students how to add/edit their preferred name in MySlice. You can also find information about the preferred name function in the Answers.syr.edu knowledgebase. Information Technology Services (ITS) is part of PNPGAC and will be developing preferred pronoun options that align with the preferred name policy. The LGBT Resource Center is also working with volunteers from around campus and the Preferred Name, Pronouns and Gender Advisory Council, and the SUNY College of Environmental Science and Forestry Chief Diversity Office to conduct outreach on campus with information about trans-related resources on campus, including showing an International Pronouns Day webinar in Room 221B Schaffer from noon-1:30 p.m. Oct. 17. Please send your questions about the University’s preferred name policy and the ability to designate one’s preferred pronoun in MySlice to PNPGAC@syr.edu.